Don't forget to check out the extension activities at the end of the FAQ section. Two music videos, and a lyric sheet, plus suggested activities. 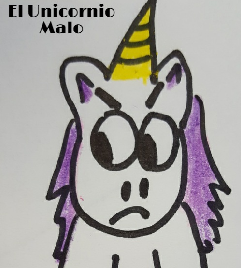 Unicornio Malo (Bad Unicorn) is an elementary version of the popular game Mafia. I was inspired to try this by the amazing Martina Bex. Martina has a wonderful explanation of this game on her blog, here, that is appropriate for older students, and if you know the directions for this game, my version is very similar. Keep reading for an explanation of my elementary version. 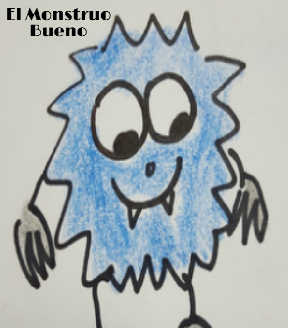 2 Monstruo Bueno (good monsters)All other players are 'la clase' or the class. The Plot: The 'Unicornio Malo' (Bad Unicorn) has been very bad all school year. So bad, that he has to go to Summer School, ALL day EVERY day. He is the only student that has to do it, so he wants to make the entire class go with him. Each night when the class goes to sleep at their houses, the Bad Unicorn goes to their house and does something REALLY bad to get them in trouble. If they are lucky, the Good Monster will save them, by fixing the problem the Bad Unicorn made and they won't have to go to Summer School. Will the Bad Unicorn win the day? Or will the class, police, and Good Monster save summer? Below the pictures of the cards, are instructions on how to play, as well as a link to download the cards! I've also added a demo video! How to Play: Have your class sit in a circle. The teacher is the narrator. 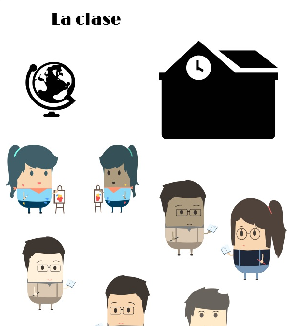 The teacher says in the target language(TL from here on): The class goes to sleep. when the teacher says this, everyone closes their eyes. The teacher than says in the TL: The Bad Unicorn wakes up. The Bad Unicorn then open their eyes. Without saying the word (using VERY quiet gestures and hand movements) the Bad Unicorns have to agree on who's house they are going to that night. Once they have agreed the teacher says in the TL:The Bad Unicorn goes to sleep. All the Bad Unicorns then close their eyes. Next the teacher says in the TL: The Good Monster wakes up. The Good Monsters then wake up. In the same way as the Bad Unicorn (with quiet gestures and as few words as possible) the Good Monsters have to agree on someone to save (yes they CAN save theirselves). Next the teacher says in TL: The Good Monster goes to sleep. The teacher than says in TL: The police wake up. In the same manner the police have to try to locate a Bad Unicorn. When they have AGREED on who the Bad Unicorn is the teacher indicates silently if they have found a Bad Unicorn or not. 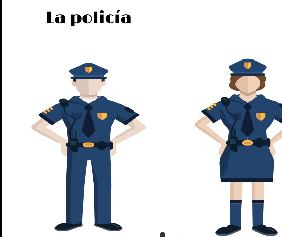 The teacher than says in the TL The police go to sleep. Next the teacher says in the TL: The class wakes up. When the teacher says this everyone in the room opens their eyes. The students have a tendency to want to start talking the moment they open their eyes so I remind them to be quiet when they wake up. In a very dramatic voice I tell the class who's house the Bad Unicorn went to last night. In order to get in more TL I start by describing the student (it also adds to the suspense). For example: 'Last night the bad unicorn went to a boy's house. A boy with brown hair. A boy with brown hair and blue eyes. Lots of different variations here as (depending on what your students know) you could describe what the student likes, or what they are wearing as well. Finally I reveal in the TL where he went (for example): Last night the Bad Unicorn went to Bob's house. Next I describe what they did, if possible, I try to do something that makes a connection with the student that was chosen. For example, if it is a student that loves chocolate ice cream, the Bad Unicorn ate the entire carton of their mother's chocolate ice cream. Or if the student is into baseball, the Bad Unicorn held a late night baseball game in their living room and broke all the windows. An artsy student? The Bad Unicorn painted all over the walls, lots of variations here depending on your students proficiency level. Once we know who was attacked I reveal whether or not the Good Monster saved the student. If the Good Monster saved them they are safe, and still in the game. If not, they are out and sent to Summer School. Once they are in Summer School students are no longer able to verbally participate in the game. Many students enjoy just watching as it is hilarious. 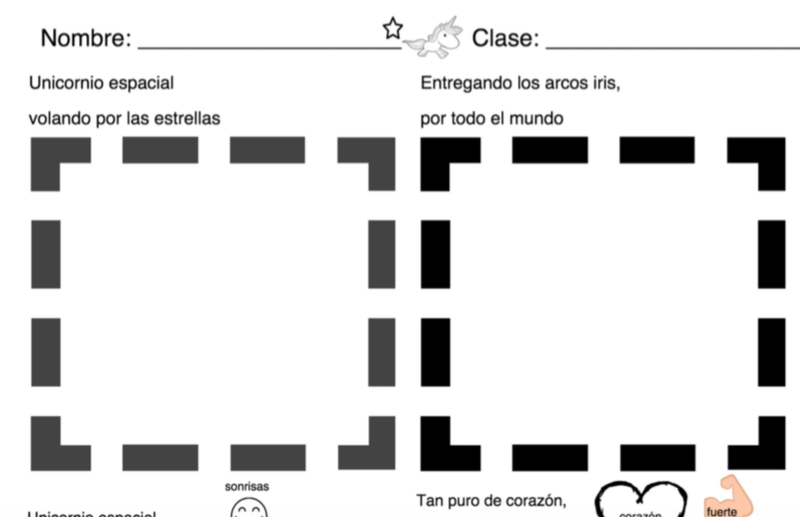 For students not interested in this, I let them play on my website, Duolingo, or they can draw a picture of what happened to them, and add some basic Spanish. Teacher:"Who is the bad unicorn?" Teacher: "Why is Maddy the bad unicorn?" Student: "Maddy is the bad unicorn because, she wasn't at my party." etc. Kids love to get very creative here, and are allowed to lie. I love listening to their creative reasoning, and emergent attempts to express themselves in unique ways. Teacher: " Maddy, are you the bad unicorn?" Student: "I am not the bad unicorn". (Though sometimes they will fess up). Teacher: "Why are you not the bad unicorn?" or "Where were you last night?" Student: "I was at Sara's house with video games." (there is often emergent language that I encourage in this game. Sometimes I allow other students to defend the person). Student 2: "Yes Sara was at my house". Finally the class votes. If the majority of the class agrees that the person is guilty they are out of the game. The cycle starts again. Keep scrolling, for some 'pro tips', and a free download of the cards! Pictures of playing Mafia/Bad Unicorn at iFLT16. PRO TIPS1) Play suspenseful music (think Twilight Zone) in the background quietly while students have their eyes closed. It will make it harder to guess. (Thank you Gregg Gross and Kristy Placido for this idea). 2) Try projecting an image of the 'scene' on your board (may take planning ahead/screen shots). 3) Check out 'Elf in the Shelf' ideas as these are also usually good "Bad Unicorn" attack ideas too. 4) Come up with some scenarios ahead of time to make it easy for you. 5) Change up the vocabulary to fit what you are playing! 6) I've heard (thanks Gregg Gross again) that there is a different version of the game called 'Werewolf' that has different 'special players'. (For example, a 'magician that can bring someone back into the game once they are out). These are enough rolls for my students for now, but I may try adding a few more 'key players' once they get better at it. If i do, I'll add an update and post the cards! 6) Is your group a little TOO excited about playing Bad Unicorn? Stop and 'circle' a detail. Did the Unicorn go to a boy's house or a girls house? Was it a boy with brown hair or black hair? Who's house did the unicorn go to? Was it Bob's house or Maddy's house? What did the Unicorn do? 7) Keep a sheet of paper out for each class and quickly jot down the rolls of the key players to make it easy to remember everyone's part during play and next time. I like to keep a blank sheet of paper on top of my 'key players' paper because I constantly set down my notes to do different things, and I often don't think about students trying to read the answers when I'm in the middle of a game. This way I don't have to remember to be so careful! 8) Don't be intimidated, it seems like a lot of rules, but once you start playing it is so fun. Even if it's not perfect the firs time, the students will have so much fun they won't care! and scroll below the picture for a FAQ section on the game. Below is a demo of myself doing Unicornio Malo with a class for the first time! ​1) If the police guess correctly about who the bad unicorn is, is the game over? No, if the police guess correctly it's not over. You quietly nod or thumbs up that they are right. They will know who the Unicorn is, but nobody else will. They can use the information and try to accuse them. They could even say they were police and knew that "Bob" was the Unicorn. However nobody knows if they are lying or not. They could even be a bad unicorn and be trying to get someone to vote out a "good guy". If they reveal they are police (and really are police) the "BU" usually try to get them the next round. Students quickly learn to be careful about when to reveal this roll. Someone is only out of the game if the class votes them out because they think they are a bad unicorn OR if the B.U. gets them and the GM (Good Monster) doesn't save them. If the police correctly identify a B.U. they can decide to use the information however they choose. 3)Do you announce to the group if the police guessed the bad unicorn? No I never announce that they know who it is, it gives a lot away. Usually a game lasts 2 class periods for me (36 minute blocks). You could stretch it and make it longer OR you could just say at the end of a period that if there are more Monsters and Police left in the game than Unicorns then the "good guys win"; but if there are more "BU" then the bad guys win. My 2nd and 3rd graders were so excited if they had a big part that a lot of them had a hard time keeping it completely secret between classes. If two much is given away, I just started over the next class (students didn't mind). Below the unicorn activities is a song by Kevin, Karla, y la Banda's version of 'All of Me'. This is a higher level activity with similar HFW! The lyrics are not fancy for this one, but I did go through and 'bold' all the words I expect my 3rd and 4th year students to know (I teach K-3 so my oldest students are in 3rd grade). Unicornio Espacial - A great song to reinforce vocab from the game! 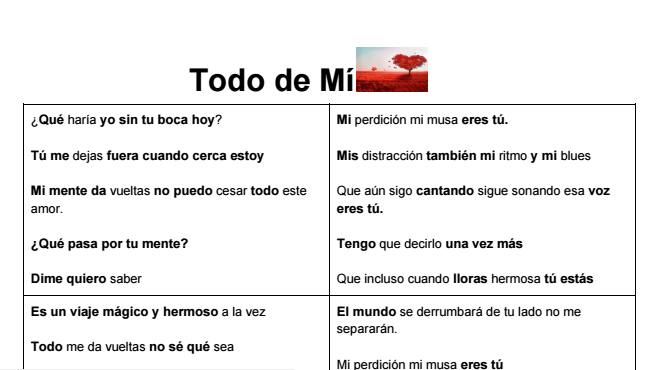 Todo de Mí - This is a great song for slightly older classes, that uses a lot of the vocabulary from the game!